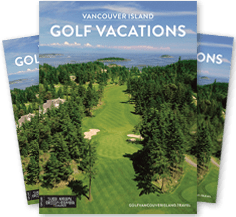 At kilometre 219 from Victoria (map) you’ll have reached the North Central Island – the tip of the Vancouver Island Golf Trail. Crown Isle Golf Course in Courtenay, BC quite possibly features the grandest clubhouse in Canada – a 48,000 square foot West coast structure – and is certainly a highlight of the trail. Here architect Graham Cooke sculpted a superb track that flows through spindly pines and gently rolling terrain, backdropped by the stunning Comox Glacier and Beaufort Mountains. Staying course-side in a luxury villa is definitely the way to go! Storey Creek Golf Course in Campbell River is a definite favourite for many golfers, returning year after year. Storey Creek is one of Les Furber’s finest and has been set into the rugged natural wilderness of dense old-growth and second-growth forest – offering one of those rare experiences where every hole is totally isolated – a must golf in Campbell River! The newest addition to the Vancouver Island Golf Trail, Campbell River Golf and Country Club, opened in 2018 after an ownership change and full course redesign. This Graham Cooke designed course caters to all levels of golfer, putting this course on everyone’s “must-golf” list! Learn more about the new course & facilities. Quadra Island Golf Course is the most northerly course on the Vancouver Island Golf Trail – located a scenic 10-minute ferry ride from Campbell River. This peaceful 9-hole golf course is known for its natural beauty and is the perfect addition to the golf trail for the Fins and Skins golfers out there who like to combine a little fishing with their golf getaway. Plan your next golf trip to the North Central Island – explore our Campbell River & Courtenay BC golf packages, call our toll free number and talk with a Golf Vancouver Island representative, or have fun creating your very own BC golf vacation quote in our “Free Instant Quotes” and get the inside scoop with the Ultimate 72-hour Itinerary.